The lady who checked us in at Silversands Caravan Site near Arisaig apologised. “The best pitches are all taken”, she said. Then she showed us ours – it has views across to Eigg, Rhum and The Cuillins on Skye. Oh and of course the white sand and the blue water in between. Heaven only knows what the best pitches are like but this one is magnificent. I always read reviews of sites if I possibly can … just in case. Actually as I write that I don’t know what the ‘just in case’ is about as we’re pretty self-sufficient and as long as they have clean water and a place to empty the loo we’re generally happy. This one gets a lot of positive reviews with the proviso that it is ‘basic’. Basic, it appears, means an oldish toilet and shower block that is kept immaculately clean, dishwashing facilities, washing machine and tumble dryer, washing lines, a microwave and a kettle for anyone’s use. The owner is laid back and friendly and the scenery is the kind of breathtaking that brings tears to your eyes. I’ll settle for basic. We chose this site because it’s across the road from Traigh (pronounced Try) Golf Course and we have carried those pesky clubs around for two months now without managing a game. The golf course is advertised as having the best views in the UK. 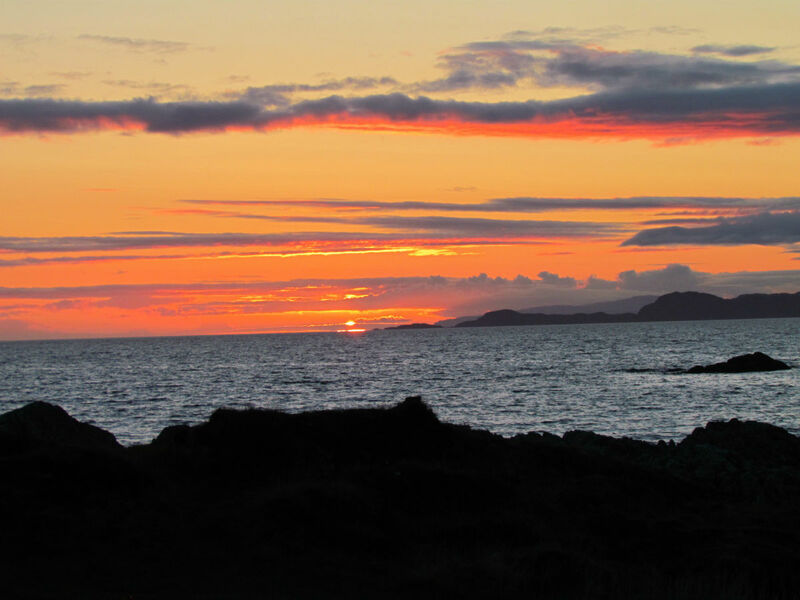 I believe it – it was hard not to stare out over the sea to Skye and concentrate on the game. That’s my excuse and … you know the rest. It’s a 9 hole course and you buy a ticket and play as many times as you want. We bought a 3 day ticket and have played three times so far. Yesterday as we approached the sixth green we met a man called Bob. He’s a friendly kind of a bloke that likes a laugh and a joke. He was much amused to find us scratching our heads as we realised that our excellent shots onto the green had actually landed us on completely the wrong green and we were miles away from the right one. We asked if he was local and he said he was from Cambuslang. He’d come up here for a weekend many years ago and didn’t go home again. Right at that moment we could believe it. The course is very hilly and by the time we were on our second circuit this morning the leg muscles were starting to object. As we dragged ourselves up to the top of a hill to tee off back down again, looking out over a breathtaking view, we saw a sign on the tee – “At this moment, is there anywhere else in the world you would rather be?” The answer was a no-brainer. Yesterday, after our first round of golf, we looked at the map and decided that it was just a short cycle ride to Arisaig itself. About three miles we reckoned, so we unlocked the bikes off the rack and set off to go and see what delights were in the village. Nothing prepared us for the fact that much of the route is vertical and of course the up side of the hills always appear longer than the downsides. We tried to flash by the people who had, perhaps sensibly, decided to walk to the village but it wasn’t long before we were walking too, pushing our bikes up the hills and attempting to look as though we just fancied a stroll. Screaming down the hill into the village, I had flashbacks to the time I knocked my front teeth out as a child on just such an incline and chickened out, applying my brakes and coasting into the village at a much more sensible speed than Shirley would have chosen, if she hadn’t been behind me. We bought cool drinks in the Spar shop, went to the marina to look at the posh yachts and finally, after delaying as much as possible, set off back up the hill out of the village and back to the van. Staggering back into the van we were met by two little dogs wagging their tails and looking meaningfully at their leads. Walkies? … oh help! This active healthy life style is supposed to be good for us but at that moment it didn’t feel like it. Before we left, we had a massive clearout of our belongings, reducing our ‘stuff’ to a fraction of its previous bulk. Since leaving home we’ve done the same thing again, reducing the amount of stuff we’re carrying by a significant amount and leaving the trailer with the unnecessary items on Adrian and Rachel’s drive. This has started us thinking about living more simply and taking up less room in the world. The digital world makes a lot of that possible by allowing us to put all our music and photos online and enabling us to read as many books as we want on our Kindles. I’m a big fan of using technology in this way, mostly because it is so convenient as well as space saving. As we trundle along on our travels the thought of living more simply has a real appeal. We’re hoping we can manage not to fill up our house with stuff again once we return to ‘ordinary’ life. But – isn’t there always a but? – none of the digital stuff works properly without a decent internet connection and as we go deeper into the remoter parts of Scotland we find ourselves with the slowest possible 3g data signal, making it impossible to stream music or films and sometimes we can’t even get radio. We do have some films and music with us on storage devices and DVDs but I’m still frustrated. I’ve started to dream of a satellite on the van roof to pick up Internet but – that’s another ‘thing’ to add to our collection. It’s also very expensive at more than £3k to buy and install so it’s one thing that will definitely have to wait. In the meantime I’ll look out the front window at the white sand beach and blue ocean and be grateful. As it said on the third tee, “At this moment, is there anywhere else in the world you would rather be?” You can guess the answer. I have taken many photos of sunsets over the years but I think I’ll stop now. I don’t know if I could ever get a more beautiful sunset than this one! Looks and sounds lovely. Love the photo of the bay!